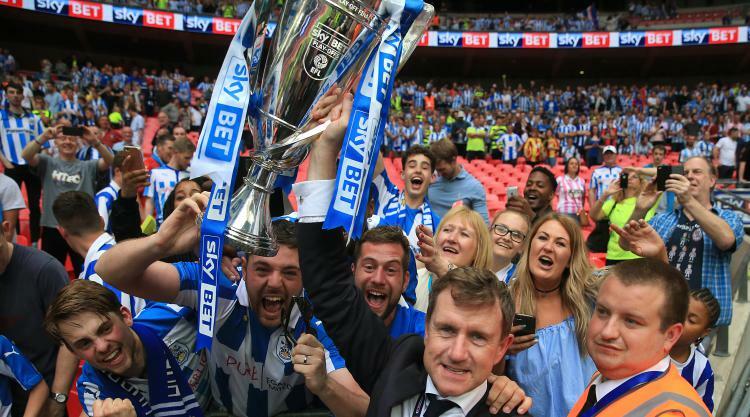 Huddersfield chairman Dean Hoyle has honoured his pledge to enable thousands of fans to watch the club's Premier League home games for little more than a fiver next season. Terriers owner Hoyle promised in 2010 that all fans who had held season cards throughout his time as chairman would pay £100 for their season card if the club reached the Premier League. David Wagner steered the Terriers back to the top flight for the first time in 45 years following their penalty shoot-out win in last month's Sky Bet Championship play-off final. "Over 4,000 Town fans who have had season cards for the entirety of Dean Hoyle's tenure as chairman will receive mail from the club this week," Town said on their official website. "The Town chairman made a Premier Pledge back in 2010; that season cards for fans who had a season card in every year of his time as chairman would be £100 if the club reached the Premier League. "This week, that pledge has been rolled out, with the 4,000-plus eligible fans receiving mail in the post." The club said fans who qualified would receive three options - to receive a £99 refund on their 2017-18 season card, which cost £199 for adults, or to receive a voucher worth £110 to spend in the club's shops, or donate their Â£99 refund to the Town Foundation charity, with Hoyle adding an extra £26 donation to top it up. "Eligible Town fans will also receive a special memento from the club to thank them for their continued support," the club added. Town's play-off final win against Reading at Wembley saw them promoted to the Premier League for the first time as they were relegated from the old First Division in 1972.